Hibernian chairman Rod Petrie insists the club are doing all they can to make sure manager Colin Calderwood bolsters a struggling squad. The Edinburgh outfit sit third bottom of the Scottish Premier League and were dumped out of the Scottish Cup by Second Division Ayr United on Tuesday. Calderwood is yet to make a signing during the January transfer window. But Petrie said: "We will re-double our efforts to add some fresh faces in this window for the fight ahead." Addressing increasingly frustrated supporters via the club's official website, Petrie added: "We will do what we have always done and continue to support the manager to the very limit of our resources in bringing new players to the club and shaping the squad the way he wants it. "We have been working consistently with Colin since he arrived to identify how we can improve things in this transfer window and again in the summer. "The lack of new faces so far is not a 'policy decision' or the lack of effort from the manager and his coaching staff or willingness and resource from the board. "Scott Lindsay [chief executive] and I had our regular, scheduled meeting with the manager and scouting co-ordinator earlier today to review progress on the many enquiries which have been made so far. "While your club always seeks to go about its business in a quiet and professional way, you should not mistake this for a lack of effort, commitment or activity." Former Nottingham Forest and Northampton boss Calderwood has won just two of the 14 games he has overseen since replacing the sacked John Hughes. And the next three fixtures throw up difficult trips to Motherwell and Dundee United and a home game against SPL champions Rangers. 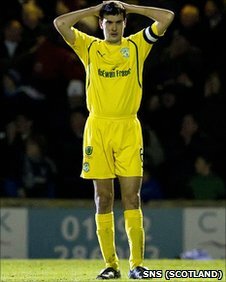 "We have missed out on the Scottish Cup final but we now have a number of 'cup finals' in the league programme ahead," added Petrie. "Silky football or ugly football, it is getting points that matters. It is points that will now define our season." Petrie has been accused of putting profit before points by disgruntled fans, who have seen the club sell on a number of their top performers in recent seasons. 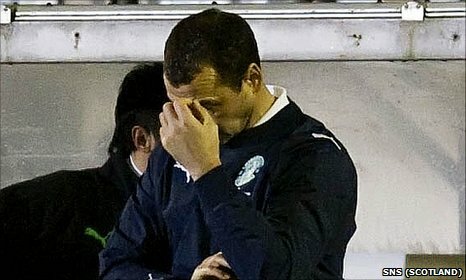 Can Colin Calderwood turn things round at Easter Road? However, former Easter Road board member Martin O'Neill has a degree of sympathy for Petrie. "The policy was, on occasions, players were sold on the basis that there were replacements within the ranks," said Lord O'Neill, who served on the board between 2004-07. "Sometimes we had assurances that we had players who were almost as good or we had players who were prepared to come in and fill the gaps. "But Hibs are not the biggest payers. They have always tried to use around 50% of gate money on wages. "Hibs is run as a business, not an ego trip for the owner, which is Sir Tom Farmer. "And while he is a philanthropist in many areas and is benign towards Hibs he is not benevolent and will not make lots of money available."